Officer Vincent Ciardiello has been on the force since 2009 and appears to be named in at least three civil rights lawsuits. He was suspended for 30 days for excessive force against a fruit vendor in 2014. In 2015 he was reportedly moved to the 88th Precinct. Why did we profile this officer? an increase from $84,005 in 2014. Includes overtime and “other pay,” but not benefits. Why did we include salary data? Click on “Continue reading” for more information about each incident, including time codes for specific events in the video, media coverage, additional videos and court documents. Ciardiello is featured in promotional image for NYPD's Neighborhood Policing Initiative. Officer Ciardiello kicks 22 year old Jonathan Daza, a street vendor, during a violent arrest following a neighborhood fair. 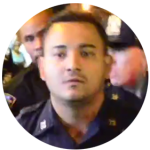 CiardIello was one of the officers involved in aggressive crowd control tactics and the violent arrest of 17-year old Enrique Del Rosario.